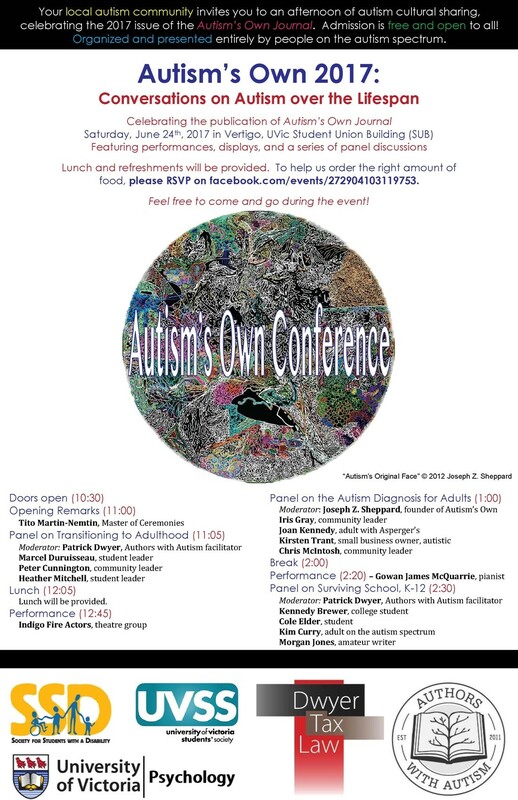 The Autism’s Own Conference is one of the few autism events organized entirely by people on the autism spectrum. It is the result of a collaborative effort by Victoria’s autism community, and it allows individuals on the autism spectrum to share their experiences and engage in dialogue with the typically-developing community. Doors open at 10:30 am. Please feel free to come and go during the event. Food will be provided. To help us order the right amount of food, please RSVP at https://www.facebook.com/events/272904103119753/. This entry was posted on June 24, 2017 by Patrick Dwyer.